Currency: The official currency of UK is Pound Sterling (£). 1 £ = Rs.93.12/- (Approx. as in 2015). Cost of Education & Living: The cost of education in U.K. is between £6500-15000 per year for Undergraduate Courses and between £7000-18000 for Post-Graduate Courses. The cost of living is approximately £6000–7500 per year, this covers all the living expenses; including accommodation, food, travel, books, clothes and entertainment. Students normally enter degree courses at the age of 18 but they can be younger and many are older. For admission to a degree course, you will need three A-levels or the equivalent. The grades you need will depend on which subject you choose and which institution you want to study at. For entry to taught postgraduate courses (master’s degrees, postgraduate diplomas and postgraduate certificates), you will need an undergraduate degree or equivalent from your country in a relevant area. For example, to study chemistry at master”s level, you would need to have a degree in chemistry. However, ‘conversion’ courses are designed to provide an intensive introduction to a subject. For these programmes, any British undergraduate degree is sufficient, even one in an unrelated area. For example, you might have studied history for your first degree, but could use a conversion course to prepare for a Master of Science (MSc) degree in information technology. For a Doctor of Philosophy (PhD) :programme, you will need a UK master”s degree or equivalent from your country. If you don”t have a master”s degree, you may be able to register initially for a Master of Philosophy (MPhil) or Master of Research (MRes) course and then transfer to the PhD programme later if your progress has been good. Master of Business Administration (MBA) courses usually require a British undergraduate degree or equivalent, or a professional qualification. Most MBA courses may also require two or three year’s management experience. If your first language is not English, you will need to provide evidence that you have a good standard of English language skills. This is because during your stay in the UK, you need to attend lectures, & seminars, study academic printed resources, produce some written works – everything in English. The institutions do not want you to fail because of language difficulty. You can prove that you can speak, write and understand English well through a variety of ways including in the form of test score results such as International English Language Testing System (IELTS) and Test of English as a Foreign Language (TOEFL). We advise you take the tests before you apply to an institution. Some institutions do not process your application until the score report is received, while some give conditional offer – that you must aim to achieve the prescribed score. You can also request the test authorities to send a copy of your score to the institutions directly. The above two test reports are usually valid for two years and hence it is advised to take the test well in advance so as to avoid delays in application process and if needed, allowing you more time to re-take the test. UK qualifications are recognised and respected throughout the world. Your UK qualification will be a solid foundation for building your future, boosting your career and prospects for a higher salary. UK universities, colleges and schools will provide a vibrant, creative and challenging environment in which to develop your potential. Quality standards for UK institutions are among the best in the world. Universities, colleges and schools continually have to prove that their courses meet strict criteria. Many other countries are now trying to follow the example of the UK. The international alumni from UK institutions includes many leading politicians, thinkers and business people who have had an important influence on the world such as Bill Clinton (former President of the USA), Thabo Mbeki (President of South Africa), Desmond Tutu (Archbishop and human rights campaigner), Rifat Ozbek (fashion designer), Wole Soyinka (Nobel prize-winning author), Stelios Haji-Iaonnu (founder of the easyGroup of businesses) and Imran Khan (cricket legend and politician). UK scientists and institutions have won almost 100 Nobel Prizes for their scientific achievements. The UK’s creative brains ‘artists, fashion designers, film and television stars, and leisure software designers’ are regarded as among the best in the world. Their work is worth ?112 billion every year. At degree and postgraduate level in particular, students are encouraged to read widely, to question and analyse what they have read, and to discuss openly their own ideas in seminars and tutorials. Career-based courses are designed to equip you for specific roles in the modern world of work. Indian 3-year degree is acceptable directly for Masters programs. Admission is possible in some institutions without TOEFL/ IELTS also. In UK all Masters courses are of 1 year and all Bachelors courses are of 3 years, unlike other Countries where Masters are of 2 years and Bachelors of 4 years. 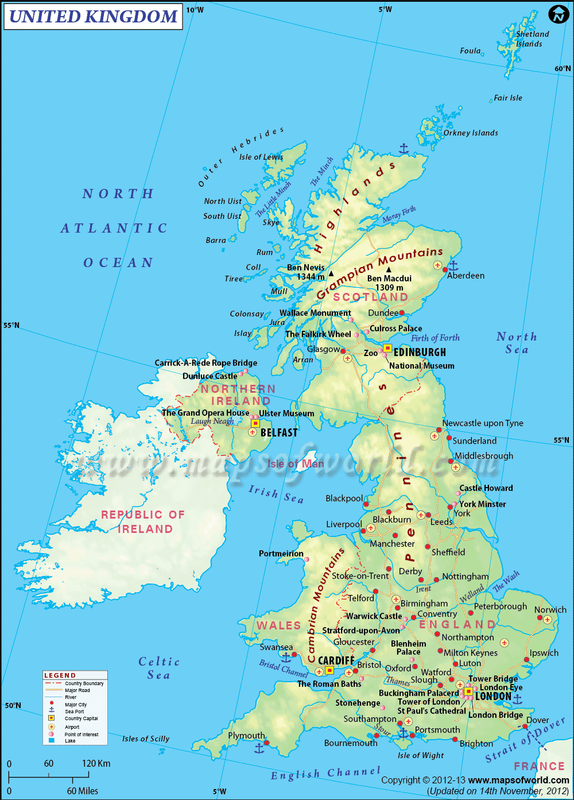 United Kingdom Map: Political Map of UK. Student visas can be obtained from the offices of the British High Commission in Delhi and the British Deputy High Commissions in Mumbai, Chennai and Kolkata. Students need to prove that they have an CAS statement from the Institution (CAS – Confirmation of Acceptance for Studies), sufficient funds to cover the entire cost of studying and living in Britain and that they intend to return home on completion of their course. Completed visa application forms (Online and Appendix 8) with two photographs.